Al Simmons (Aloysius Harry Szymanski) was a premier hitter and left fielder for Connie Mack’s formidable Philadelphia Athletics from 1924 to 1932 and subsequently for other major-league clubs through 1944. Simmons was born in Milwaukee on May 22, 1902, the son of Polish immigrants. He played high-school baseball before briefly attending Stevens Point Teachers College as a football player and later playing semipro baseball in Juneau, Wisconsin. The hometown Milwaukee Brewers of the American Association signed the hard-hitting 6-foot, 200-pounder in 1922 and sent him to Aberdeen, South Dakota, of the Class D Dakota League, where he hit .365 in 99 games. He also played in 19 games for Milwaukee that season, getting 11 hits in 50 at-bats (.220). Moved up the following year to Shreveport in the Texas League, he duplicated his performance, hitting .360 in a full season before playing out the rest of the season with the Brewers, where he sparkled, hitting .398 in 24 games. Though he was still the property of Milwaukee, Simmons was interested at the time in playing for New York Giants manager John McGraw. In 1922 he wrote to Roger Bresnahan, the manager of the Giants’ American Association farm team at Toledo, and indicated his availability for $150 in expenses. Bresnahan never responded. Years later, Simmons often commented, “I’m not sure I would have enjoyed playing for McGraw. We were both hotheads and I’m afraid we’d have clashed.” Athletics owner-manager Connie Mack purchased Simmons’ contract from Milwaukee after the 1923 season and Al was an immediate success with the A’s, debuting on April 4, 1924, and hitting .308 with 102 RBIs in his freshman year. He had a breakthrough season the following year with a sensational .387 average and an eye-opening 253 hits. 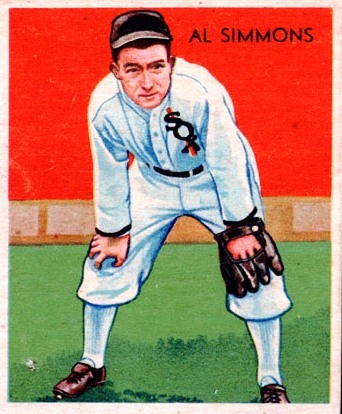 In 1926 Simmons “slipped” to .341 and 199 hits. He was hampered by injuries the following two seasons although he hit for high averages. But he rebounded over the 1929-31 seasons and, along with Mickey Cochrane, Lefty Grove, and Jimmie Foxx, carried Connie Mack’s A’s to three straight overpowering pennant wins and two World Series victories. Simmons was at his peak during those three years. In 1929 he led the American League with 157 RBIs while hitting .365. In 1930 and 1931 he had league-leading .381 and .390 averages. In 1929 he won the MVP award. In his last season with Connie Mack, 1932, Simmons hit .322 while again leading the league in hits, with 216. Simmons holds the major-league record for reaching 1,500 hits in the fewest games, 1,040. Simmons hit .329 in the four World Series in which he played. He touched off the most improbable inning in Series history, the seventh inning of the fourth game between the A’s and the Cubs in 1929. With the Cubs ahead 8-0, Simmons led off the inning with a home run. The Athletics batted around and were losing by only 8-7 when Simmons singled in his second at-bat of the inning as the A’s completed a historic and unforgettable ten-run inning and went on to win, 10-8. Simmons had one of his most impressive days on Memorial Day in 1930. The first-place A’s were losing to the second-place Washington Senators 6-3 with two out and two on in the bottom of the ninth. Simmons homered to tie the game. He doubled in the 11th inning but was left stranded. Simmons doubled again in the 13th but again did not score. He doubled again in the 15th, his fourth straight extra-base hit, and finally he was driven home for a 7-6 win. Before he scored, he injured a knee but managed to limp home. On the field Simmons was a warrior, intent on damaging the opposition and demolishing pitchers with his bat, stifling opposing teams’ rallies with his glove, and upsetting infielders with violent takeout slides. He never lost his intensity for baseball even when he was an Athletics’ coach after his playing days. During batting practice, the Yankees’ Tommy Henrich used to urge coach Simmons to grab a bat and display his old hitting form. Henrich remembered: “It was something to see. When Al Simmons would grab hold of a ball bat and dig in, he’d squeeze the handle of that doggone thing and throw the barrel of that bat toward the pitcher in his warm-up swings, and he would look so bloomin’ mad even in batting practice, years after he had retired. In 1932 Simmons hit .322 with a league-leading 216 hits, but it was a difficult year for Connie Mack as, after three straight pennants, his club finished second to the Yankees, and the relatively high salaried A’s cost more than he could afford. And so, at season’s end, Simmons was traded to the White Sox along with infielder Jimmy Dykes and outfielder Mule Haas for $100,000. Simmons had two decent years with the White Sox (.331 and .344), helped out when the team moved home plate closer to the outfield fences. But in 1935, playing for an uninspiring second-place club, the 32-year-old Simmons slipped, his batting average dropping to .267 and his RBIs slipping below triple-digits for the first time in his major-league career. Years later, Simmons admitted to a writer that he had accepted the White Sox’ second-division attitude and had slacked off in his customary strenuous practice habits. It was time to move on and in the offseason his contract was sold to Detroit for $75,000. The Tigers had won the 1935 pennant. Although he was well past his prime, Simmons hit .327 with 112 RBIs in 1936, but the Tigers finished behind the murderous Yankees. And Simmons was dealt to Washington after the season. Simmons had two indifferent years with the Senators, then suffered through the 1939 season with the Braves and the Reds. After returning to the A’s in 1940-41, he sat out the 1942 season as a coach but with World War II military demands for younger players, he became a virtual baseball relic, appearing in 40 games for the Red Sox and batting .203. After six at-bats for the Athletics in 1944, he retired. He played in only 90 games in his last four big-league seasons. Simmons was a player-coach for the A’s in 1944, then remained with Connie Mack as a full-time coach through the 1949 season. He concluded his major-league involvement by coaching for the Indians in 1950-51. Simmons had a lifetime batting average of .334 with 2,927 base hits (including 539 doubles) and 1,828 RBIs. Despite his induction into the Hall of Fame in 1953, Simmons is not rated by all baseball experts as highly as his gaudy statistics would suggest. Bill James did rate him seventh among left fielders based upon his 375 Win Shares. But in the Seventh Edition of Total Baseball, possibly through inadvertence, Simmons was not rated among the top 100 all-time players. Simmons married Doris Lynn Reader of Chicago in August 1934. The couple had one son, John, before divorcing. Because of religious convictions, the restless, lonely Simmons remained single after his marriage broke up. Close personally to Connie Mack, Simmons told a writer, “Mr. Mack seemed to look on me as his son. He never stopped feeling sorry for me about the breakup of my marriage,” and Mack unsuccessfully urged him to patch things up. Simmons died in his beloved Milwaukee on May 26, 1956, four days after his 54th birthday.